In this time of world strife, let us remember the open hearts and hospitality of our Irish ancestors, who had initially been treated as poorly as all non-WASP immigrants that arrived in America in the early centuries. Let us not forget that the Native and Indigenous tribes had populated the world continents before colonization against their will and their genocides, much as the Irish had been disenfranchised of their ancient ancestral homelands through the process of religious discrimination. Even in Waterbury, Connecticut, the topic of my 2015 publication, Waterbury Irish: From the Emerald Isle to the Brass City, the arrival of Italians and other nationalities had been historically met with discrimination, including by the Irish. My childhood friend, Dave Manzo, contributed this important photograph to Waterbury Irish that represents an evolved time when the Irish and Italians got along so well that Irish-Italian marriages had become quite common. Dave’s dad, of Italian descent, is included in the photo riding in a horse-drawn coach full of his Irish friends at a Saint Patrick’s Day parade circa 1937. Not only could Mr. Manzo quickly list every county in Ireland, but his very best life-long friend was Irish — the owner of Waterbury’s former Wacki Grill. 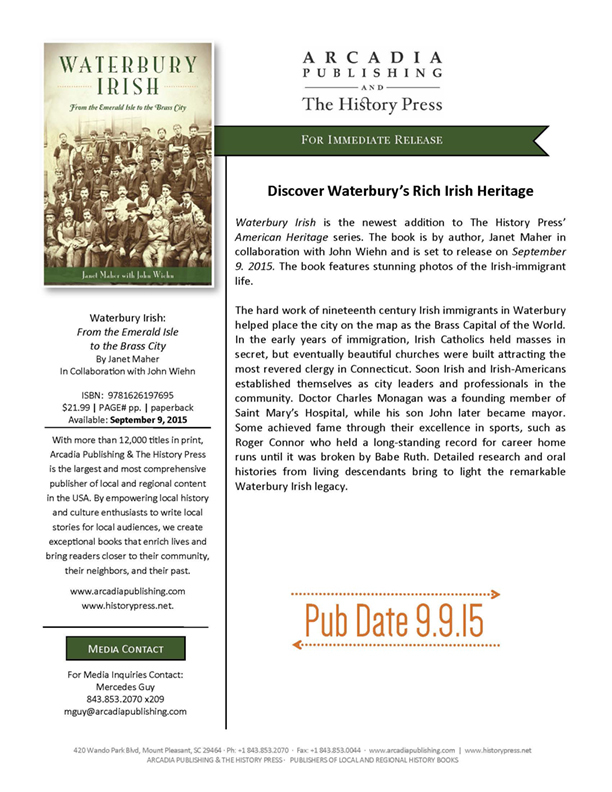 I still have paperback copies of the first edition of Waterbury Irish, should anyone wish to purchase one. You can contact me through my website (troll safely typed here — janetmaher dot com), or please leave a comment, all of which are first approved by me before they are posted here. All good wishes on this day and always, with special prayers on behalf of those suffering persecution of all kinds in New Zealand, North America and throughout this endangered planet. Press Release for Waterbury Irish! Although my initial research was primarily about the Meaghers/Mahers, when it came time to edit information to include in my book (From the Old Sod to the Naugatuck Valley: Early Irish Catholics in New Haven County, Connecticut) I chose to keep the content more generally broad. Maher details are sprinkled throughout the history of Ireland and early Connecticut chapters, however, leading to a focus on the nineteenth century in America. I find myself repeatedly refering to Joseph Casimir O’Meagher’s 1890 text, Some Historical Notices of the O’Meaghers of Ikerrin, which I consider essential for beginning research about the Mahers. It provided most of the earliest Maher details in my book, and I included several instances of historic Mahers from his book in a previous post here (August 20, 2012), Some Notable Meaghers/Mahers and other spellings, cited SHN. Excerpts from O’Meagher’s text occur verbatum in many different places, and are, unfortunately, usually not attributed to him. I have been singing his praises online since at least 2006 and am happy to see that a Google search on him now brings up many hits, including his full text. Although not perfectly scanned, an inexpensive reprint of Some Historical Notices is also available from Amazon. A member of the Royal Irish Academy and Fellow of the Royal Historical and Archaeological Association of Ireland, O’Meagher was able to cite his lineage directly from John O’Meagher, who with his mother, Anne, had been among those ordered to transplant to Connaught after the conquest of Oliver Cromwell. John O’Hart’s pedigree of O’Meagher drew Joseph Casimir’s Heber line out from Fionnachta, second son of Conla, “No. 88 on the O’Carroll (Ely) pedigree.” As noted in my previous post, (Our Mileasian Origins) Conla was son of Cian, who was a son of King Olliol Olum. O’Hart considered the O’Meagher pedigree in his book as the ancestral line of O’Meachair, chiefs of Ikerrin. From Fionnachta (No. 88) O’Hart listed Joseph Casimir O’Meagher, born 1831, living in Dublin in 1887, as the son of John T. O’Meagher (No. 127). The line then extended to Joseph’s children: Joseph Dermod (1864), John Kevin (1866), Donn Casimir (1872), Malachy Marie (1873), Fergal Thaddeus (1876) and Mary Nuala (no date given). Joseph Casimir O’Meagher himself, however, cited additional pedigrees that extended Meaghers from other points in the Cian branch, including Teige or Thaddeus (No. 38) and John (No. 39). O’Meagher provided immense background that led to my further research about such pivotal events in Ireland as: the development of ancient Irish Catholicism and communities of ecclesiastical families, the arrival of the Vikings and Normans, the interest of the English monarchy in Irish lands and sequences of sanctions and acts of “land grabbing” over the centuries, the change in the official religion of England from Catholic to Protestant with Henry VIII, the Penal Laws, continual rebellion on the part of the native Irish and those aligned with Catholic subjects of England who became equally disenfranchised due to adherence to their religion, the Statutes of Kilkenny, the Flight of the Earls, Civil War, arrival of Oliver Cromwell, the Act of Settlement, Oath of Allegiance, Act of Union, Wild Geese, Catholic Relief Acts, Rebellion of 1798, various uprising groups and key figures among them, the Catholic Emancipation Act of 1829, Tithe Defaulters, Catholic middleman landlords, and mass emigrations before, during and after the Great Famine. Here, long before the Irish War of Independence and the formation of the Irish Free State in 1922, my story in From the Old Sod to the Naugatuck Valley shifts to the arrival of the first Irish Catholic settlers in particular sections of New Haven County, Connecticut. For those of us who know that our families were among the many who had already dispersed from the ancient homeland before they emigrated it is interesting to note that even O’Meagher’s group, with several of his sons attending university in Dublin, were no longer based in the Roscrea (Ikerrin) area of Tipperary by the late 1800s. In 1659 Sir William Petty’s census had already showed Meaghers in several neighboring areas of Ireland (Our Mileasian Origins). We do well to read the very helpful 1993 article by William J. Hayes, O Meagher, Meagher and Maher – and their dispersal in Tipperary, which can be purchased from the Tipperary Historical Society. He explained the tendency for many of the Meaghers to have aligned with the powerful Normans, particularly the Butlers who remained Catholic, and thus retain much of their property over centuries of struggle, at least into the seventeenth century. After Cromwell, however, all bets were off. Excerpts from this article are archived on RootsWeb. O’Meagher also chronicled the dispersion from northeast Tipperary through his accumulation of data, including details of many eighteenth and nineteenth century Meaghers/Mahers who left to join foreign military units or settle in America. So many Irish came to America as outlaws, slaves, or indentured servants and worked in obscurity, likely experiencing life in conditions worse than those which they left. Before the Famine, however, some were affluent enough to choose to make the trip across the sea and begin anew on equal footing in the Protestant communities of America, long populated by those still aligned to British sentiments about the Irish, in general, and about Catholics in particular. Had these Catholic immigrants been middlemen or related to one in Ireland? Had they married into families that had somehow retained a semblance of wealth or at least maintained some financial stability? Had their families been merchants, one trade allowed to Catholics? Had those from Kilkenny worked in the Ormond factory? What must it have been like to try to blend into a new world and assimilate as quickly as possible and still manage to help bring others over and begin the forbidden first Catholic churches? When we wish to play the record of Irish history and locate our families amid it, where we drop the needle matters. We need to consider every fact in light of what else was going on at that point in time in Ireland and in the location into which they would emigrate. Much of that, sadly, revolves around religion, in ways similar to the major struggles between countries that exist today. Then, as today, there were open minds seeking peace on both sides of each conflict, and the fundamentalists on either side began quickly to resemble each other. We must study what we find, however, in its own context. With the Meaghers, history seems to center around land and religion. Catastrophic events make significant changes from one century to the next, but the seemingly small details in the decades surrounding someone’s departure from Ireland may help to shed the most light. Having thoroughly scoured the “ground zero” of the place to which my ancestors relocated and their presence within it, I hope to still learn more about the events surrounding the time and area that they left in the Old Sod. Dunphy, Ger and Christy O’Shea, Ballinakill, A Journey Through Time, Freshford, Co. Kilkenny, Ireland: Barnaville Print and Graphics, 2002. Hayes, William J., “O Meagher, Meagher and Maher – and their dispersal in Tipperary,” Tipperary Historical Journal, Thurles, Co. Tipperary, Ireland: Leinster Leader, Ltd., 1993. Excerpts online. O’Hart, John, Irish Pedigrees: or, The Origin and Stem of The Irish Nation, Fifth Edition in Two Volumes, Dublin, Ireland: James Duffy and Co., Ltd., 1892. Online. O’Meagher, Joseph Casimir, Some Historical Notices of the O’Meaghers of Ikerrin, Library of Congress, Washington, D.C., American Edition: NY, 1890. Online.